As the growing presence of non-linear loads and distributed energy resources place new demands on electric power metering equipment, standards organizations are revising their testing guidelines to address the resulting challenges. Recent updates to two of these standards, ANSI C12.1 and ANSI C12.20, specifically address the distorted waveforms and various power-quality phenomena that have become a new normal for facility operators. As a new Schneider Electric white paper discusses, these revisions support the development of ANSI revenue meters that make the most of the latest developments in advanced metering technology. 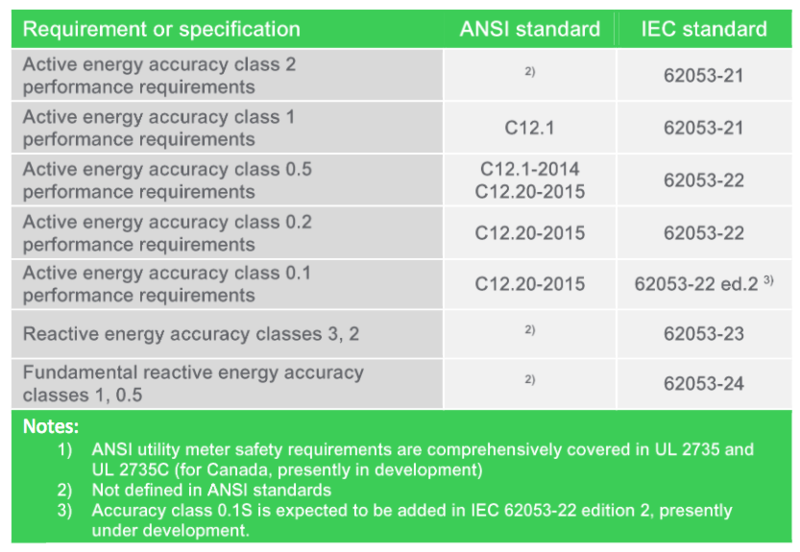 The American National Standards Institute (ANSI) oversees both ANSI C12.1, “American National Standard for Electric Meters – Code for Electricity Metering,” and ANSI C12.20, “American National Standard for Electric Meters for Electricity Meters – 0.1, 0.2 and 0.5 Accuracy Classes.” The most recent editions of these standards are ANSI C12.1-2014 and ANSI C12.20-2015. Though these are both voluntary standards, they do form the basis for the testing requirements set by most North American utilities and utility commissions for their revenue (i.e., “billing”) meter requirements. ANSI and International Electrotechnical Commission (IEC) metering standards have developed in parallel with each other, with IEC testing guidelines predominating in many nations outside North America. The two groups’ standards series share a number of tests and construction and performance requirements. They differ, however, in how they categorize meters – either by current classes or connected location – and in reference points for testing. The tables below offers a high-level view of how ANSI and IEC metering standards relate to each other. ANSI C12.1-2014 addresses the increased presence of distributed energy resources on the distribution grid by adding new test requirements for bi-directional meters. Now, if a meter is designed to measure energy flow in both directions, then test conditions must be applied twice – once with energy flowing in the forward, or “delivered” direction, and once with energy flowing in the reverse, or “received” direction. This requirement applies to starting-load tests, load-performance tests, and tests of the variation of power factor. ANSI C12.20-2015 recognizes the increasing accuracy of today’s metering equipment with its introduction of a new accuracy class. The standard’s previous edition identified accuracy class 0.5, with an error rate not exceeding 0.2% under test conditions, and accuracy class 0.2, with an error rate not exceeding 0.1%. Meters meeting requirements for the new accuracy class 0.1 will have an error rate not exceeding 0.05%. 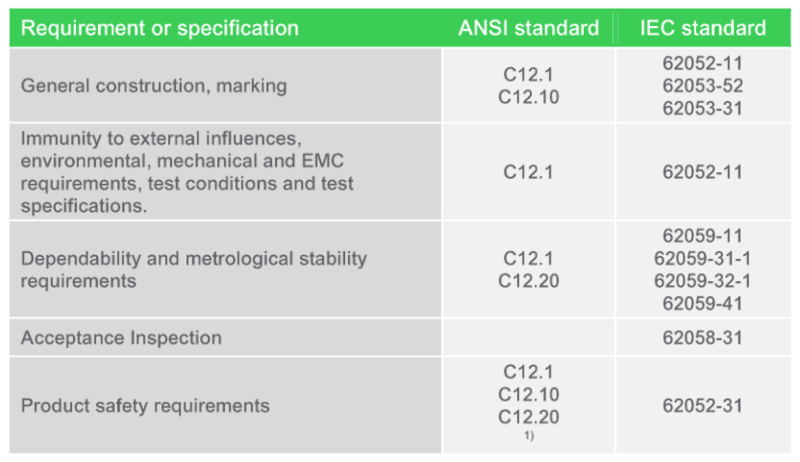 ANSI C12.20-2015 also addresses the impact non-linear loads and renewable energy generation can have on the performance of today’s distribution networks with a requirement for what is likely the most comprehensive testing for the influence of harmonics to date. The revision introduces six new tests to verify meter accuracy under a variety of non-sinusoidal voltage and current conditions. 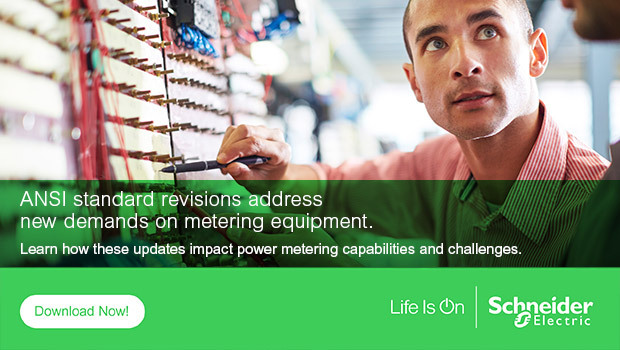 These latest revisions will result in updated meter designs that incorporate recent advances in metering technology and meet customer demands for robust performance and accurate billing measurements. Download the white paper for more details on these revisions and the testing processes they describe.